JCM is offering the UNLOCKING THE MYSTERY OF LIFE video free of charge to science teachers in the state of Oklahoma, including public and private schools. JCM believes Oklahoma's students should be informed of multiple views of origins that exist in our culture today. Students should not be indoctrinated with the theory of evolution as the only view of origins. Our schools should teach the evidence that exists which points to a designer. One very logical and scientific view is that of an intelligent designer creating the complexity of life we observe on the earth today with a point of origin. Most in Oklahoma believe this is a better explanation for our origin, and not a naturalistic random chance process over millions of years. 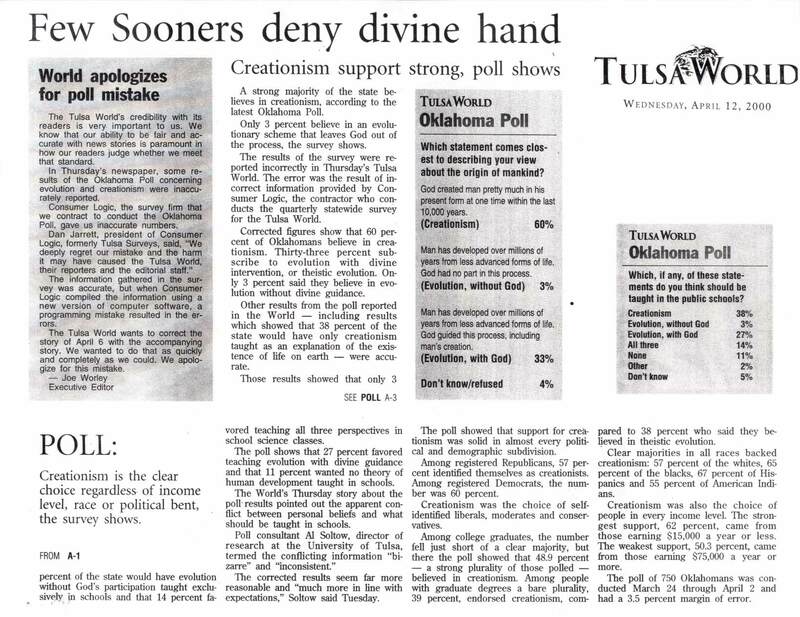 A Tulsa World poll, published on April 12, 2000, showed that 60% of Oklahomans are creationists while only 3% are naturalistic evolutionists (36% were mixed or did not know). The UTMOL video does an excellent job of making the scientific case for an intelligent designer in a way that is acceptable for even public school viewing. Note: Some of the individuals on the UTMOL video do not agree with the JCM Statement of Faith. However, we still believe the video represents a good method for schools to show students the evidence for design. Note: you do not need to be the teacher. Are you a student, parent, etc? Would you like a teacher you know to receive this video. Feel free to fill in the required information and press the submit button. Teacher information will be kept confidential. Funds do not allow us to distribute this video to individual homeschool teachers - as much as we would like to be able to do this :-) However, if you are part of a larger homeschool group that will be sharing the resource, then feel free to send for the video.